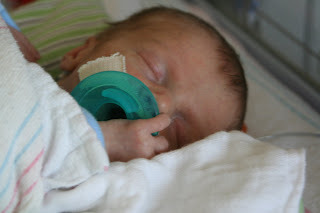 Goerlich Quadruplets: Finn - Come on Home! Well, we thought we'd have Finn home by now - he was due to be home on Wednesday then they pushed it to Thursday or Friday and now it could be another week or longer. 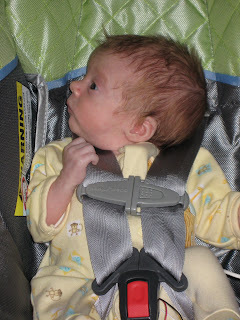 He took his car seat test on Tuesday, which he failed the first time by having a sleeping Brady during the test. So he studied up that afternoon and passed it on Tuesday evening. Still, they called me on Wednesday and said they'd like to keep him a bit longer because he isn't taking his bottles in full and he is still having problems with his oxygen saturation while feeding. I guess the little guy wants to stick with his brother, Noah, for a while longer. One nurse told me that every time Noah starts crying Finn opens his eyes and looks over his way as if he knows it's his brother in need. She thinks Finn and Noah have a deal that they are going to stick together no matter what. Noah needs our prayers. He is having some breakdown of the skin around his stoma which is making it difficult to keep his ostomy bag in tact. This makes for uncomfortable days for him as they have to replace the bag 4 - 6 times a day. Every time they do this they change the feeding tube which is causing ulcerations and bleeding of his fistula. The bag change is also painful for him since each time they have to rip the tape off of his irritated skin. We were hoping to be talking second surgery next week, but it looks like patience is the name of the game for us right now. The surgeon told Chris that we should expect the surgery to be at the end of October or later. Chris is off on Tuesday and we would like to meet with the surgeon in person to voice our concerns about his skin and the fact that he has to go through that pain so many times each day. We'd like to know if it's better to chance doing surgery early to relieve this or if they think it's still better to wait. My heart is broken right now as I desperately want my boys home and to have the family all together. Won't that be a joyous day! Cohen and Sophia are doing really great at home. I had them by myself for an afternoon last week while my parents went to the hospital to visit Finn and Noah. It was so much fun but I was having a bit of a panic thinking about being alone with 4! I am a friend of the Walton's and I want you to know we've been following the progress of your family and that my 88 year old mother and I have been praying for all of you. We will step up prayers for Noah. God has blessed you with these beautiful children and we know that He will bless Noah and make him well. I pray everyday for your family, but today I am going to make a specific prayer for you two. Never feel like you can't get a babysitter because there are 4. I know yu two have such a special relationship and you already know that alone time is a necessity. Please feel free to ask. Some of my greatest successes as a parent were when I followed my instincts and put the books away!!! The books are very helpful as references and information but God entrusted the fabulous foursome to you two and God knows you can handle it!!! Thanks so much for making the time to keep up with the website - and always find time for yourselves too!! The task of being a parent is a great joy and sometimes a burden with worry and concerns, but just keep on taking it to God in prayer - He will give you the knowledge and strength to complete the task. Just depend on His power! You are all always in my prayers and I love the updates so the prayers can be specific. I am still in Seattle helping my dad so we can then head on the cross country drive back to Texas with Manny the dog. Dad is going to stay with Todd & I for a while this winter. The rainy season is about to set in here in the Pacific NW. Things are stiull extremely tough but we are making it one day at a time. Love to you both,Jaz, and the 4 babies. Hey guys!! Poor baby Noah! i was debating on what to get four of and what to get two of, you will have to let me know if they all love the swings. Keeping you guys in my prayers and thoughts. The latest pictures and video are great. Everytime I think one is the cutest you add another picture that steals my heart! Praying for you - as a couple, as parents, and for each child's needs. Stay strong and be patient - our God is an awesome God!